Casper and his schoolfriends are still reeling from the discovery that they’re in a special class of secret superheroes. But more shocks are in store when a MONSTROUS new teacher arrives. She says her name is Mrs Cloddle – but CLODZILLA is more like it! Big Feet Pete, Sarah and the Cartoon Kid must put a stop to her! And that’s just the first of their nutty adventures… WHAM-BAM-JELLY-AND-JAM! Create your very own superhero character. Let your imagination run wild! Inspired by Cartoon Kid? Create your own cartoon strip here! This is the funniest book in the series and the illustrations are great. 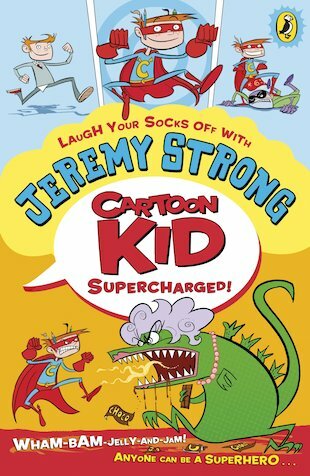 I thought this book was very funny and I enjoyed reading about Cartoon Kid’s funny adventures.